Innovate Baits chose Hooklinks to help develop their identity with logo design, a web presence and design their original packaging. During 2010 Hooklinks have help extended their brand image on the POS packaging and associated display material. This required full design and layout of full size sheets up to A2 to facilitate production of all product,self adhesive labels and bags. Additionally they chose to develop their promotional advertising by commissioning a completely self managed web site and on-line store. Both developed using the Content Management System employed by Hooklinks and the eCommerce software to manage the on-line sales of their products. Innovate Baits are a new innovative company producing top quality steamed rolled HNV carp baits and support products, the baits are new and are ‘steamed’ and not boiled. 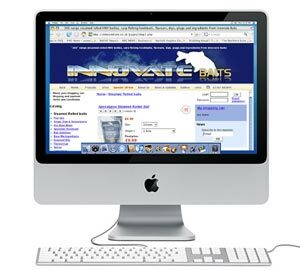 The Innovate Baits website has a #1 ranking for various keywords in their market: ‘steamed rolled carp baits‘ being the prime product. 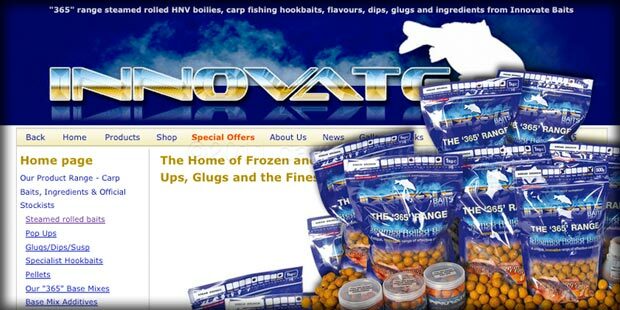 Others are ‘hnv carp baits‘ ‘steamed baits‘ with many other 1st page listings on most search engines. Quality SEO work from Hooklinks has helped achieve this..